About the Turner Team Inc.
We live in the neighborhood and have a unique perspective on historic homes. 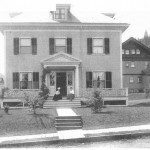 We applied for and added the 1902 William L. Brewster House on NW Lovejoy St. to the State Historic Preservation Office Special Assessment program in 2005 and the Robert F. Hall House on NW Hoyt in 2008 during their complete restorations which we oversaw. We haven’t just read about the intricacies we’ve experienced them. Your privacy is important to us as it is to you. We do not share your information with thrid-parties. This privacy statement discloses the privacy practices for AlphabetDistrict.com and the Turner Team Inc.